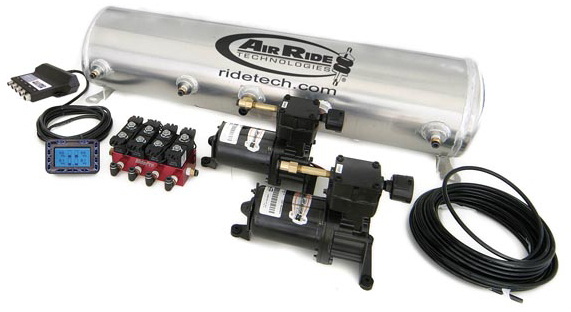 Update your vehicles handling and ride with a Ridetech RidePRO 4 way system. Adjustable ride height along with independently adjustable airsprings allow a setup for whatever you encounter. Kit Includes: Compressor System, 4-Way Electric Solenoid. Includes Model 327 Compressor, Analog Control Panel, RidePro Valve Block, 3 Gallon Tank, 1/4" Airline, Fittings, and Installation instructions. 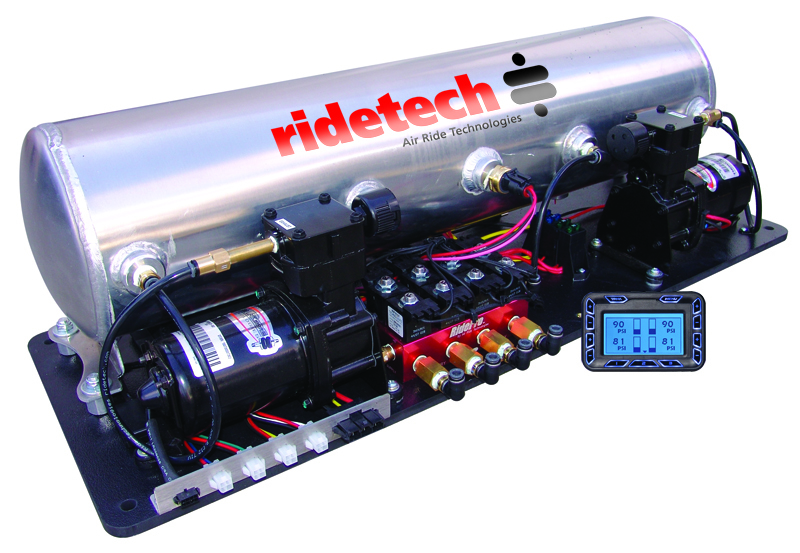 Ridetech RidePRO manual 4 way compressor system with 5 gallon tank. Fully upgrade down the road to a digital system by adding level sensors and the RidePro digital controller package. Kit Includes: Compressor System, 4-Way Electric Solenoid. Includes 2 Compressors, Analog Control Panel, RidePro Valve Block, 5 Gallon Tank, 1/4" Airline, Fittings, and Installation instructions. Kit Includes: Compressor System, 2-Way Electric Solenoid. Includes Model 327 Compressor, Analog Control Panel, RidePro Valve Block, 3 Gallon Tank, 1/4" Airline, Fittings, and Installation instructions. 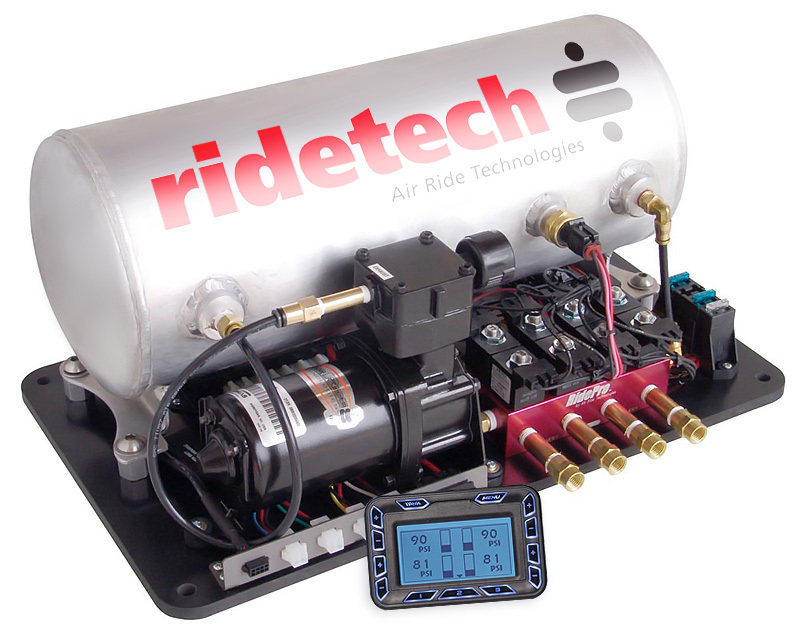 The Ridetech AirPod system is a completely integrated system allowing for faster installation. 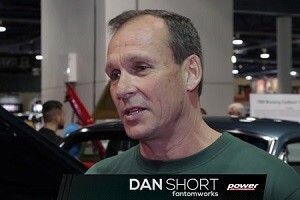 With only 4 plumbing and 3 wire connections to make, you'll be heading to the local show or track faster then you ever imagined. The controller allows for 3 ride height settings and optional LevelPRO sensors. Kit Includes: AirPod 3 Gallon Compressor System. 4-Way RidePro Digital Computer Controlled. Uses Pressure Based Programming. Includes AirPod, 1/4" Airline, Fittings, and Installation Instructions. Kit shown is a base model kit. Upgrades available for this kit include: 5 gallon tank, Big Red Valve upgrade, LevelPRO ride height sensors, digital remote control, smartphone app kit and AirPod cover. Please call our sales department at 800-841-8188 for more information and upgrade pricing. Easily hide your AirPod system and connections with the Ridetech 3 gallon AirPod cover. Easily hide your AirPod system and connections with the Ridetech 5 gallon AirPod cover. 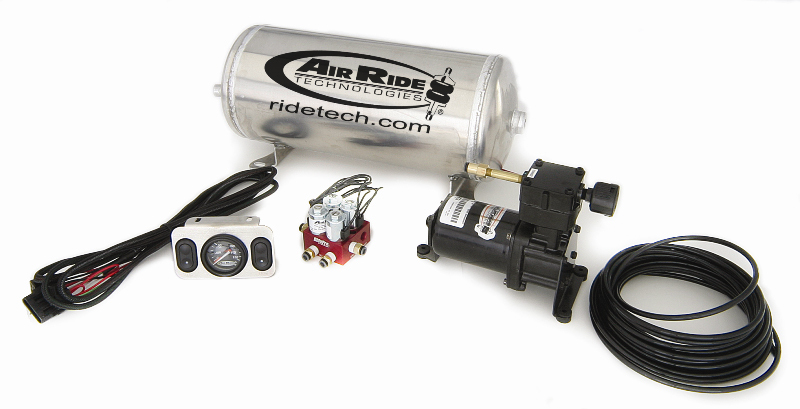 The Ridetech AirPod system is a completely integrated system allowing for faster installation. This system is an upgraded model offering a 5 gallon tank and upgraded compressor. With only 4 plumbing and 3 wire connections to make, you'll be heading to the local show or track faster then you ever imagined. The controller allows for 3 ride height settings and optional LevelPRO sensors. Kit Includes: AirPod 5 Gallon Compressor System. 4-Way RideProDigital Computer Controlled. Uses Pressure Based Programming. Includes AirPod, 1/4" Airline, Fittings, and Installation Instructions. Kit shown is a base model kit. Upgrades available for this kit include: Big Red Valve upgrade, LevelPRO ride height sensors, digital remote control, smartphone app kit and AirPod cover. Please call our sales department at 800-841-8188 for more information and upgrade pricing. RideTech HQ Shockwave series are a perfect upgrade for the performance oriented driver. 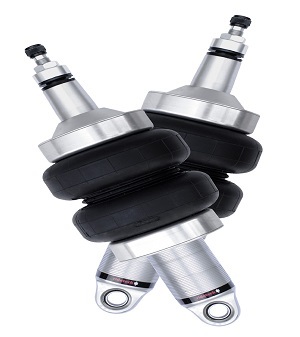 The Handling Quality series shocks are an upgrade of the RQ series and offer single rebound shock valving adjustment with a monotube design. Geared towards performance driving with a high level of adjustability, the HQ series will not sacrifice your ride quality. Compatible with Heidts IFS suspensions for the Chevy C-10 and Ford F100. Note, a different swaybar will be needed if upgrading to this air ride suspension. This is not a complete air ride kit, prices shown are just for the bags. A compressor system with hoses and wiring would also be needed if adding this as an all new system. 4.1" stroke shock with 1.7" eye mount. 6.5" diameter double convoluted bag. Shockwave mounted right side up. Custom Spacers to suite 1.410" bracket width and 1/2" bolt offset. RideTech HQ Shockwave series are a perfect upgrade for the performance oriented driver. 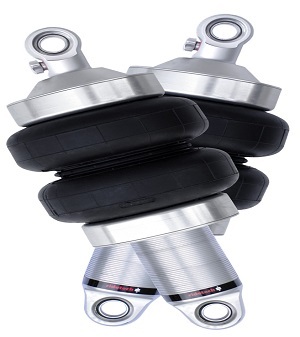 The Handling Quality series shocks are an upgrade of the RQ series and offer single rebound shock valving adjustment with a monotube design. Geared towards performance driving with a high level of adjustability, the HQ series will not sacrifice your ride quality. Compatible with Heidts rear suspensions for the Chevy C-10 and Ford F100. Note, this is not a complete air ride kit, prices shown are just for the bags. A compressor system with hoses and wiring would also be needed if adding this as an all new system. RideTech HQ Shockwave series are a perfect upgrade for the performance oriented driver. The Handling Quality series shocks are an upgrade of the RQ series and offer single rebound shock valving adjustment with a monotube design. Geared towards performance driving with a high level of adjustability, the HQ series will not sacrifice your ride quality. 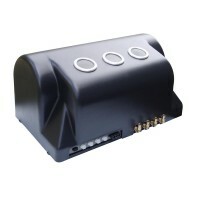 Compatible with Heidts Superide II, early Nova Superide II, Heidts IRS and Heidts Classic Trucks IFS. Note, this is not a complete air ride kit, prices shown are just for the bags. A compressor system with hoses and wiring would also be needed if adding this as an all new system. RideTech HQ Shockwave series are a perfect upgrade for the performance oriented driver. The Handling Quality series shocks are an upgrade of the RQ series and offer single rebound shock valving adjustment with a monotube design. Geared towards performance driving with a high level of adjustability, the HQ series will not sacrifice your ride quality. Compatible with Heidts early Nova Mustang II suspension system. Note, this is not a complete air ride kit, prices shown are just for the bags. A compressor system with hoses and wiring would also be needed if adding this as an all new system. Must pocket rails for clearance. RideTech HQ Shockwave series are a perfect upgrade for the performance oriented driver. The Handling Quality series shocks are an upgrade of the RQ series and offer single rebound shock valving adjustment with a monotube design. Geared towards performance driving with a high level of adjustability, the HQ series will not sacrifice your ride quality. Compatible with Heidts PRO-G IFS. Note, this is not a complete air ride kit, prices shown are just for the bags. A compressor system with hoses and wiring would also be needed if adding this as an all new system. RideTech HQ Shockwave series are a perfect upgrade for the performance oriented driver. The Handling Quality series shocks are an upgrade of the RQ series and offer single rebound shock valving adjustment with a monotube design. Geared towards performance driving with a high level of adjustability, the HQ series will not sacrifice your ride quality. 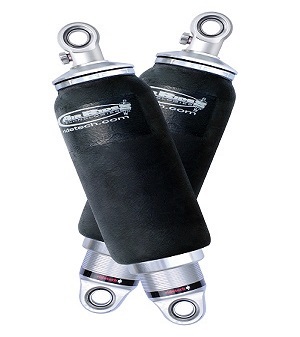 Compatible with Heidts Mustang II suspensions. Note, this is not a complete air ride kit, prices shown are just for the bags. A compressor system with hoses and wiring would also be needed if adding this as an all new system.